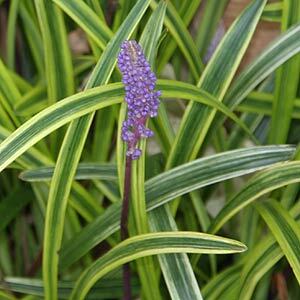 If you are looking for a ground cover that will give your garden a bit of a ‘lift’ the maybe the Liriope Muscari Variegata is the one to do it. Similar growing habits to other forms but this variegated Liriope is not only a clump forming groundcover, it also has wonderful green and yellow to cream striped foliage as well as the pretty lavender blue flowers from spring through summer. It looks great when plated in a container, as well as mass planted in the garden as a ground cover or a border plant. When mass planting a spacing of around 30cm will allow clumps to fill in fairly quickly as mature plants reach around this width. Variegated Liriope Muscari will reach a height of 30cm with flower spike around 15cm above this. Best grown in part shade or dappled shade, as in most Australian conditions full sun in summer can be a little harsh and drying. A humus rich moist but well drained soil is best although this is a fairly adaptable plant. In terms of soil ph, again not really that fussy but a little on the acidic side seems best. Excellent when planted on sloping ground as a ground cover that will help erosion control. Also useful for underplanting with deciduous trees. A wonderful edging plant for a path or driveway and attractive when grown as a specimen in a container or pot. This is a relatively low maintenance plant once established. Water in new plants well with a seaweed fertiliser, and during hot dry periods a little extra water is needed. A general purpose slow release fertilizer applied in late winter to spring and again in late summer to autumn as rains begin again. Soil – Humus rich, moist. Spread – Will form a clump of 30 cm over time.